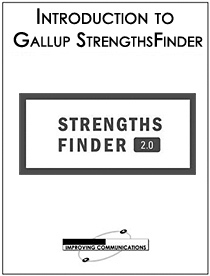 For decades, the Gallup StrengthsFinder assessment has given more than 14 million people a way to discuss and develop their unique combination of skills, talents, and knowledge known as strengths. Every day, thousands of people around the world discover their strengths. Gallup research proves that people succeed when they focus on what they do best. Led by a Gallup-experienced instructor and backed by decades of research, this program will help you identify your greatest talents, pinpoint what you do best, and develop ways to use your talents for success. Gain insights into your natural talents by working with your Gallup Strengths Signature Themes Report and Strengths Insight Report. Fully understand how strengths develop. Learn how to harness your talents and strengths for greater personal productivity and engagement. Acquire tools and insights to help you use your natural talents to fulfill your goals and achieve your greatest potential. *This learning session requires a pre-read and online assessment at least one week prior to the program. More information will be provided upon enrollment. I just wanted to tell you how much I enjoyed your class. My perspective on written communications has improved. This enlightenment will enable me to be a more effective communicator. Thanks again.